SINTEF, in collaboration with NTNU, has completed a study entitled “Industrial opportunities and employment prospects in large-scale CO2 management in Norway“. The study was carried out on behalf of the Confederation of Norwegian Enterprise (NHO), the Confederation of Trade Unions (LO), the United Federation of Trade Unions, the Federation of Norwegian Industries, the Norwegian Oil and Gas Association and the Industri Energi trade union. 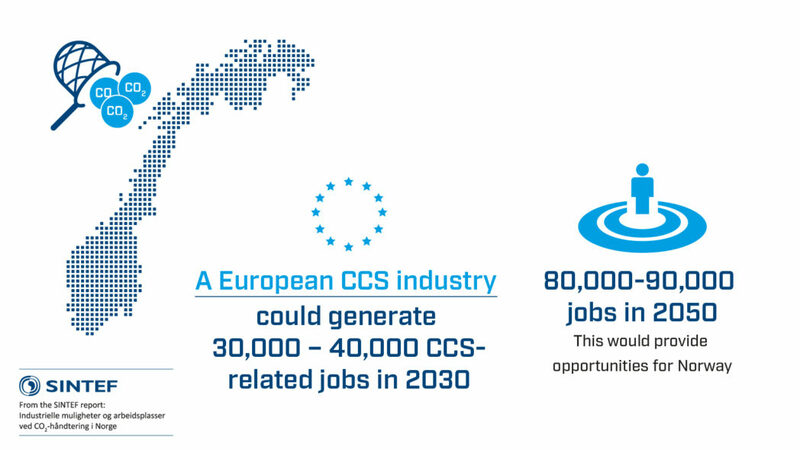 The objective of the study (assuming a commitment to large-scale CCS in Norway and subsequently in Europe and the international community) was to determine what opportunities large-scale CCS can present to Norway and Norwegian industrial operators. The study placed particular emphasis on potential value creation and employment. This blog is based on a presentation on 25 April 2018 of the report from the study. A link to the full report (in Norwegian) can be found below. Global warming shall not exceed 2 degrees. Global warming shall preferably not exceed 1.5 degrees. The Fifth Assessment Report of the UN Climate Panel shows that CCS plays a decisive role in 114 of the 120 modelled scenarios in which warming was limited to below 2 degrees. The proportion of emissions that must be reduced by means of CCS varies somewhat between scenarios, but CCS must contribute to between 12 and 20 per cent of the total greenhouse gas reductions. If one is to limit global warming to 2 degrees without making use of CCS, the cost will be nearly 140% higher, if at all possible, according to the IPCC. In other words: The world needs CCS technology if it is to achieve the goals of the Paris Agreement. CCS involves capturing CO2 from power generation, industry, the combustion of biological material or the production of hydrogen from natural gas, and storing it in rock formations underground. Norway has natural advantages in the form of geological structures in the North Sea which can accommodate a large part of the CO2 produced in Europe. About 40% of the total storage capacity in northern Europe is in Norway. In addition we have advantages with regard to expertise, since we are a leading nation in several stages of the value chain for CO2 management. In Norway, a full-scale CO2 management project is being planned and assessed. Planned emission sources for CO2 capture are Norcem’s cement factory in Brevik, Yara’s ammonia plant in Porsgrunn, and Fortum Oslo Varme’s waste incineration plant at Klemetsrud. It will be the first project that captures CO2 from the process industry and waste treatment. It will be the first project that combines several emission sources and uses ships to connect the emission sources to the CO2 storage sites. The project could potentially be the first step towards the establishment of the Norwegian continental shelf as a large-scale centralised storage facility for European CO2. 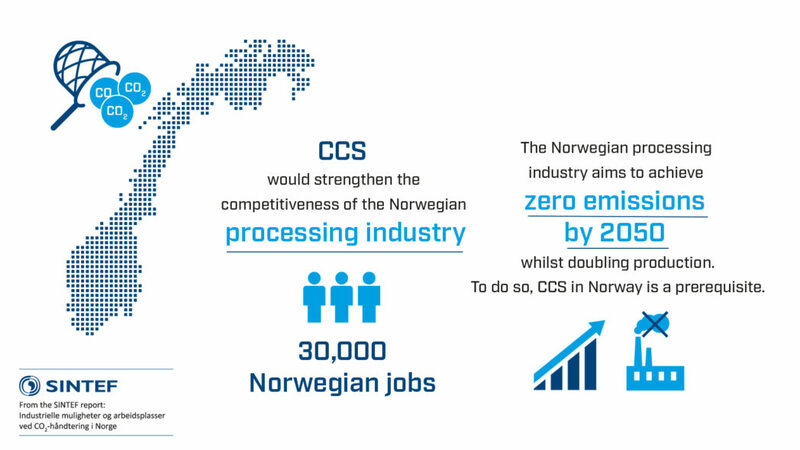 This part deals with the opportunities that CCS infrastructure in Norway will be able to provide to industry – potential for reducing emissions of CO2 from industry and thereby manufacturing products with a low CO2 footprint. 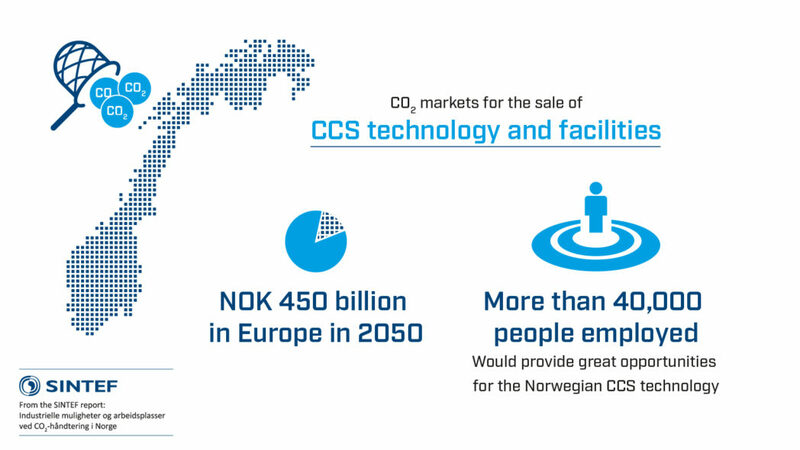 The assumption connected with these results is that CCS infrastructure will be established in Norway with enough capacity to store the CO2 captured by Norwegian industry through CCS. This part deals with the growing market for CO2 management in Europe and the market scope and employment potential that this could provide. We also consider the potential Norwegian share of such a market. 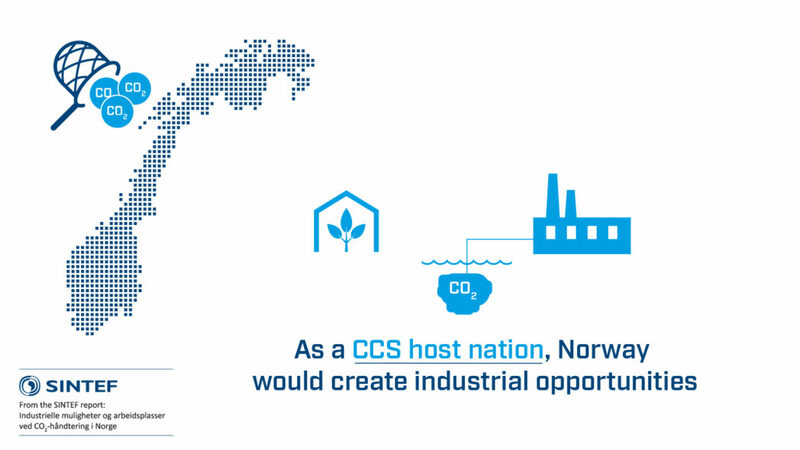 The assumption connected with this part of the report is that Norway, Europe and the rest of the world develop and launch CCS technology to the extent described in the climate scenarios produced by the International Energy Agency and the UN Climate Panel. In this part of the study we analyse three scenarios in which the scale of CCS increases from moderate to high. In the final part of the report we look at the more immediate impacts of the full-scale project, assuming that it is developed as planned, with CO2 capture at all three sources. Since 1990, the Norwegian process industry has cut its emissions by 40%, while production has increased by 37%. This demonstrates a facility for readjustment and increased competitiveness in the process industry. According to the report “Veikart for prosessindustrien“ (Roadmap for the process industry) published in 2016, the goal of the Norwegian process industry is to achieve zero emissions in 2050, while at the same time doubling production. CO2 management in Norway is a precondition for achieving this goal. As much as 60% of emissions cuts will be effected by means of CO2 capture and storage. The realisation of such an ambition will increase the competitiveness of more than 30,000 existing jobs in Norway through growth potential, while at the same time reducing emissions towards zero. With the proximity of infrastructure for CO2 management, Norway can become an attractive host nation for industry, thanks to the enhanced potential for manufacturing emission-free products. This, in combination with the availability of reasonably-priced, renewable energy, will potentially form the basis for new industrial establishment in Norway at a time when the proportion of costs resulting from the workforce is dropping. This applies, for example, to companies that wish to produce hydrogen from natural gas using CCS in Norway. Hydrogen is an energy carrier which can be produced from natural gas. Producing hydrogen in this way initially emits CO2, but by using CCS the process can be decarbonised. This means that hydrogen can become an energy carrier with a low carbon footprint. Hydrogen can become an important supplement to the role played by natural gas in the present-day energy system, being complementary to fluctuating renewable energy sources. Hydrogen has many areas of use, for example in energy generation, heating and cooling, as a fuel (especially in the marine sector), and as an ingredient in energy-intensive industries such as steel production. Several companies, including Statoil are showing interest in hydrogen. 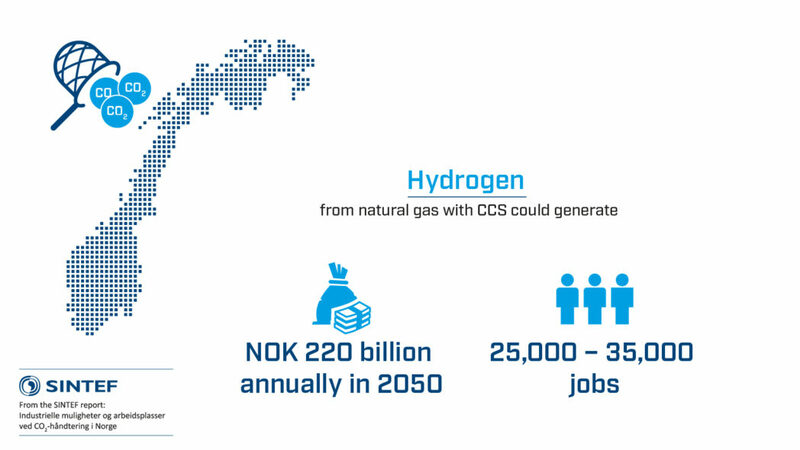 By 2050 hydrogen production can become a major industry in Norway: The study shows that the production of hydrogen from natural gas using CO2 management can lead to sales amounting to NOK 220 billion per year in 2050 (in 2017 kroner), and produce 25,000 to 35,000 jobs. This sort of commitment to hydrogen production from natural gas can contribute to an extension of the market potential for Norwegian natural gas resources, especially in view of the fact that the EU has set climate goals which in practice mean zero CO2 emissions from the energy sector by 2050. Access to large quantities of “low-carbon” hydrogen will also potentially reinforce other industries, such as the Norwegian maritime sector, which can be assisted in the transition to zero-emission transport at sea. The report also considers the potential for using so-called “carbon dioxide-enhanced oil recovery”, or CO2 EOR. Norway has a clear policy of increasing hydrocarbon recovery and the efficient use of resources in the oil and gas fields on its continental shelf. CO2 EOR may provide potential for extending the lifespan of petroleum fields in the North Sea, thereby making better use of existing infrastructure and providing greater returns on investments made on the continental shelf. 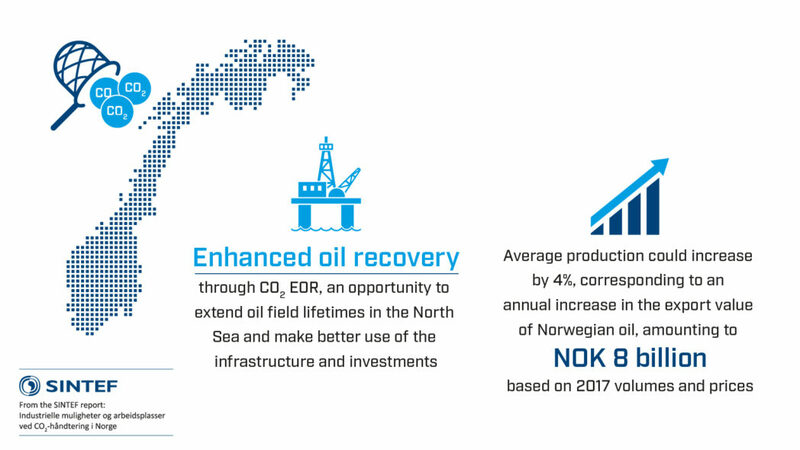 The average increase in production can be around 4%, which corresponds to an annual increase in the export value of Norwegian oil of NOK 8 billion, based on 2017 volumes and prices. For the purposes of the study, three scenarios were defined for the roll-out of CCS in Europe: Low, Moderate and High level CCS. The scenarios are based on the climate scenarios of the IEA and IPCC. The figure above shows how much CO2 must be captured and stored in Europe in 2030 and 2050 for each of the three scenarios. The scenarios range from 50 million tonnes of CO2 captured and stored per year in 2030 in the Low CCS scenario to more than 1000 million tonnes captured and stored per year in 2050. The figure also shows the estimated cost development for CO2 management in terms of NOK/tonne of CO2: our model assumes a gradual drop in costs as CCS is rolled out, primarily as a consequence of learning effects and effects of scale. Finally, the figure shows the estimated scale of costs for CO2 management in the whole of Europe in the three scenarios. In 2050 this may potentially amount to between NOK 190 billion and NOK 900 billion. If CCS is rolled out as described in the scenarios of the IPCC and IEA, the scale of the market for CO2 management will be substantial in 2050. The market for CO2 management in Europe will potentially involve from 30,000 to 40,000 jobs directly linked to CO2 management in 2030 and from 80,000 to 90,000 in 2050. 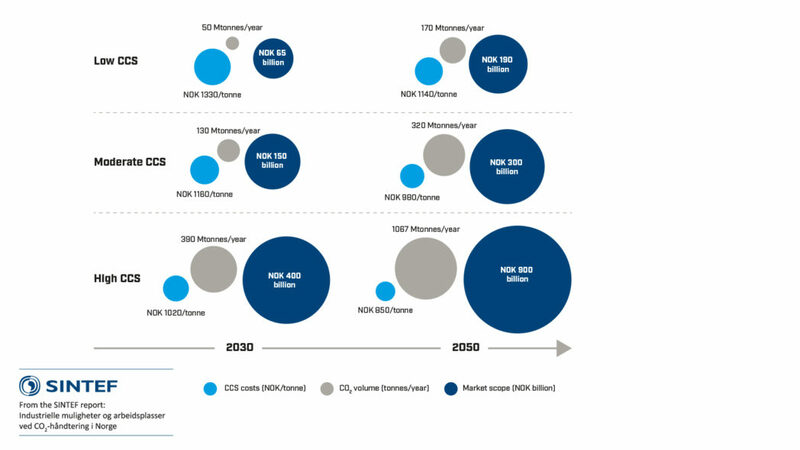 This is the scenario for High CCS, according to which more than 1000 million tonnes of CO2 are captured and stored annually by 2050, with the value of the market being around NOK 900 billion per year. If such a market develops, Norwegian operators will be well equipped to increase their value creation. The Norwegian shelf provides a natural resource in the form of geological formations which are suitable for the storage of CO2. The Norwegian shelf can be developed into a centralised storage facility for CO2 from Europe, which can potentially form the basis for significant value creation. Moreover, Norwegian expertise in petroleum and offshore operations is highly relevant to a commitment to CO2 storage, and the industry is therefore well equipped. 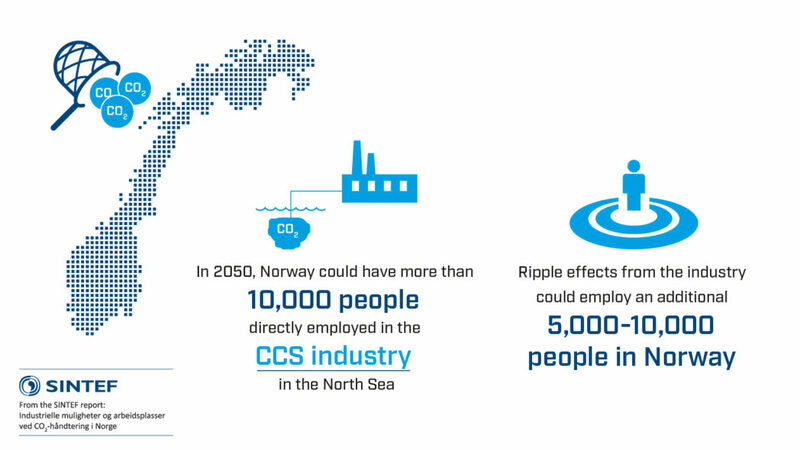 Over 10,000 jobs directly linked to CO2 storage in the North Sea. The ripple effects may result in a further 5,000 to 10,000 jobs. If we are an early mover in CO2 storage, it is not inconceivable that Norwegian operators can acquire an even larger share of the market. 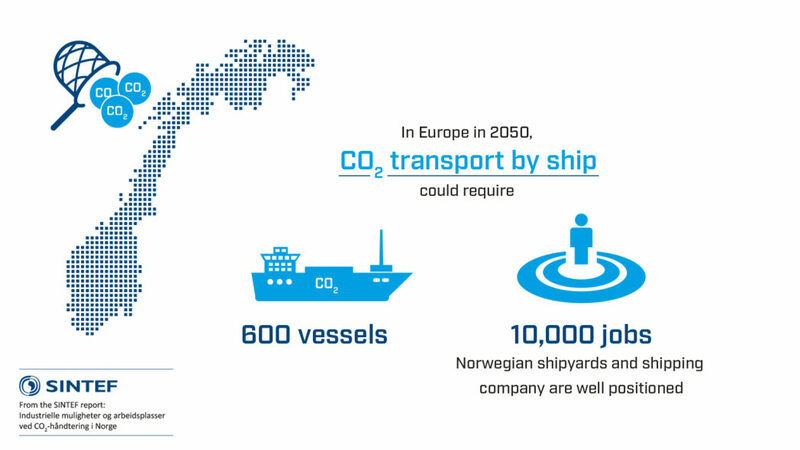 If CO2 is transported by ship, there is a potential need for a fleet of more than 600 vessels in 2050. This could provide employment for 8,000 to 10,000 people. The shipping and shipbuilding industries have previously shown their ability to turn their hands to, and be involved in creating, new markets. An example of this is the way the industry has committed itself to the market for transportation of liquid natural gas (LNG) and subsequently by making use of natural gas to fuel ships. Norwegian shipbuilders have also demonstrated particularly high competitiveness in industrial sectors involving demanding technology and complex systems. Norwegian shipbuilders and shipping companies are therefore in a good position to acquire shares of an emerging market for transportation of CO2 in Europe. The largest market in the field of CO2 management will be connected with CO2 capture. In 2050 this could involve sales of NOK 450 billion and employ 40,000 people in the construction and operation of installations. This is a market in which there will be considerable competition from international operators, but Norwegian operators will still be able to acquire a share of this market. The premier example of a Norwegian company which would be capable of competing internationally is perhaps Aker Solutions with its amine technology, but there are almost certainly others. 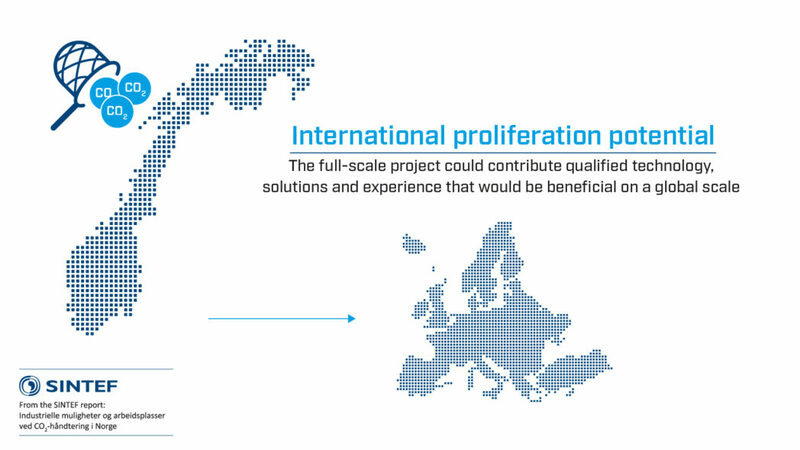 Companies could qualify for the international market by way of the full-scale project, which has already been tested at Mongstad and Brevik. The Norwegian full-scale project could potentially provide up to 5,000 person-years directly linked to the project. These will mainly be jobs in Norway. 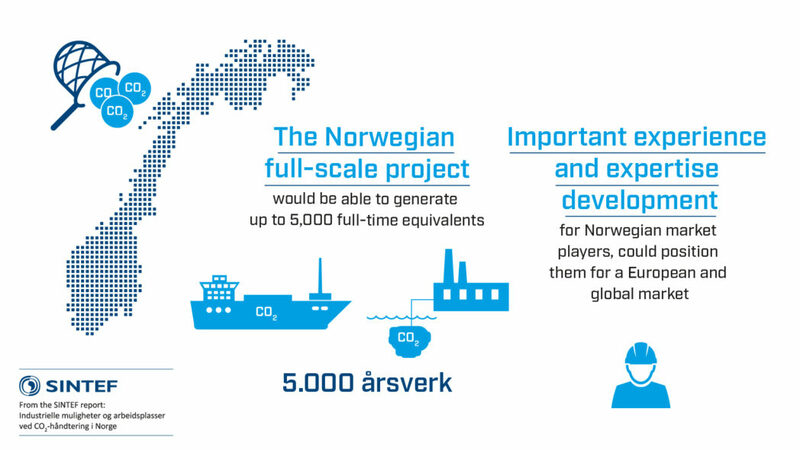 However, for Norway the most important aspect of the full-scale project, apart from its contribution to limiting emissions of CO2 from Norwegian industry, will be the development of experience and expertise acquired by Norwegian operators. The full-scale project will provide the operators with unique experience in the form of contributing to the planning, implementation and operation of CO2 management infrastructure. In all, the full-scale project will contribute to positioning and qualifying Norwegian operators in the European and global market, and give them a competitive advantage relative to operators which do not have a domestic market for CO2. Heidelberg Cement, which owns the factory at Brevik, is the world’s second largest cement producer, with 80 factories in Europe. Fortum, which owns the waste incinerator plant at Klemetsrud has a total of 23 combined power and heating plants, four of them in Sweden. Corresponding potential for exchange of experience and expertise also exists in the transportation and storage sectors. In all, the experience acquired through the full-scale project will provide important know-how which will be capable of lowering the barriers to future projects. Improve the competitiveness of between 80,000 and 90,000 jobs in Norway in the process industry, natural gas operations and shipping. 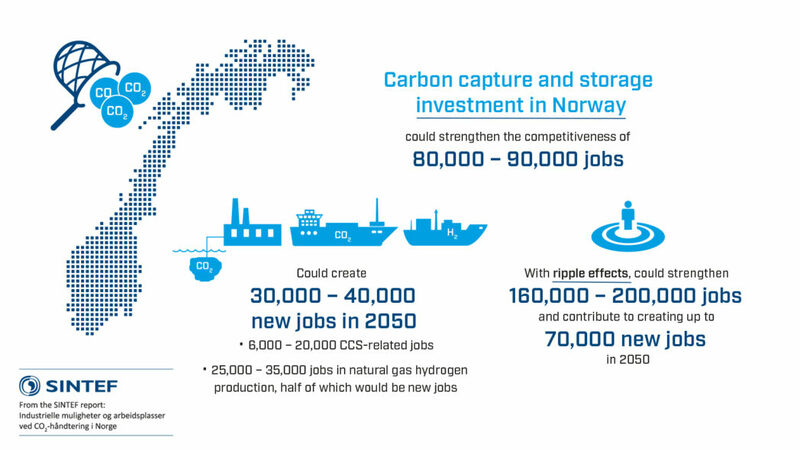 Create 30,000 to 40,000 new jobs in Norway connected with the market for CO2 management in Norway and Europe, and with the production of hydrogen from natural gas. The total number of jobs in Norway directly and indirectly linked to these industries could be 70,000 in 2050. If we include jobs indirectly connected with these industries, the total number of direct and indirect jobs resulting from such commitment will be between 160,000 and 200,000. Let us hope that this will devellop into CCUS!. Other energy reserves like unminable coallayers exploration and other sources (fosile and none fossil),, can be implemented in this devellopment. Let us also hope that present natural gas systems wil remain (Besides hydrogen) in use!. Thank you for reading our blog, and for the comment, Jan Greefkes! When it comes to CCUS, this is a topic which there has been (and still is) put a lot of research efforts into. After working both with CCS and CCUS for many years, my view has become crystal clear: the use of CO2 for products can be nice is some quite specific situations, however – and more importantly – CCUS has no climate mitigation potential. This is because reuse of CO2 does not remove the carbon from the carbon cycle, the emissions are merely posyponed until the product is used. The cost of CCUS is also highly debatable, as CO2 is a “dead molecule” having close to zero potential – it is waste product. Case studies have shown that early movers into CCS could have an added value and an extra revenue string from making products. However, the n’th CCS project would only produce chemicals/products which will not anymore be necessary, since markets will be flooded with products at quantities much higher than needed (because of the very large quantities of CO2 needed to be captured). Thus, permanent storage of CO2 is the only feasible option in the long run – and for having significant climate change mitigation impact.